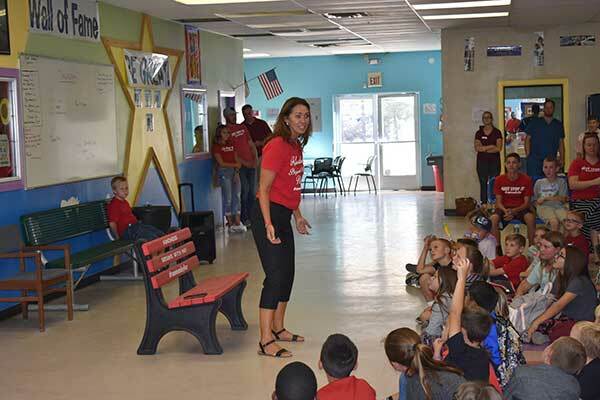 SAFFORD – A bright red bench with “Kindness Begins with Me” was dedicated at the Safford Boys & Girls Club Thursday afternoon. 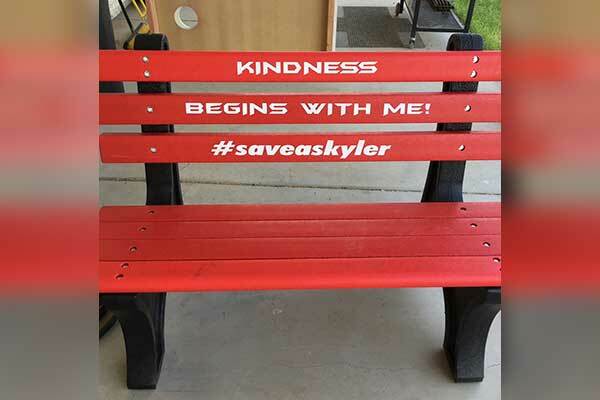 Funds to create the bench were raised by the Gila Valley Leadership Class 13 and the bench was donated to the boys & girls club. Patty Wren made a brief presentation and explained the purpose of the Save-A-Skylar campaign. The room was dotted with people wearing red shirts that either said, “Kindness begins with me,” or “Just stop it.” Wren began her presentation by explaining that the campaign has changed its focus. Wren told the group that focusing on what actually happened makes it easier for adults to react to the situation appropriately. Wren told the kids that if they need a friend and sit on the bench, somebody might come sit by them and be their friend. Wren went on to explain the troubles her son had while in school that served as the catalyst for the Save-A-Skylar campaign. She encouraged the kids to care for one another. The bench will be placed outside in the playground.